All week, the Divas have been peeking the new sets and wowee.. I can hardly wait to get my hands on them! This is always the case for me when it is release week. When I sat down to make a card using this sketch, I realized that I hadn't had a chance to play with the sets from the last release. With my other DT commitments, life in general and summer, time just got away from me. So, this time, I decided to ink up one of those sets. They were all jam-packed with fabulous sentiments showcased in fun fonts, so this is what I'm focusing on here with my "sentiment" card. My patterned paper is from the Kaisercraft Lush collection. "Hang in there" is from Always on My Mind. It is framed in a circular frame from Waltzingmouse Vintage Circles, Small and cut out with a Spellbinders Classic Circle die (love how it fits this image perfectly). I am hoping to squeeze in more Verve sketch time tomorrow.. wish me luck! The release is tomorrow at 8 PM EST.. yay! On another note, I'd like to thank Monique for this lovely blog award that she awarded me last week. She chose me as one of the 15 blogs she loves. I am truly honored to receive this award, Monique! If you aren't familiar with her work, please visit her blog here for some fabulous eye candy! In the spirit of the award, I am supposed to pass this on to 15 others. 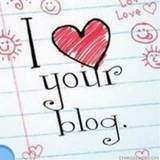 I cannot possibly choose just 15 people whose blog I love, so I pass this on to each one of you who inspire me! Accessories: Classic Circle Nestabilities (Spellbinders), Ribbon (Papertrey Ink), Foam tape, Thread, Sewing machine. Stephanie this is wonderful!!! What a fabulous job you did with the sketch, love the borders, sentiment panel and all your sewing!!!! Beautiful card, Stephanie, I have to agree with you about Verve...I absolutely adore them! I love the sewing around the edges and the super cool colors you used. Hope you can get more time in your 'happy place' to make more Verve-y goodness! Love your card. 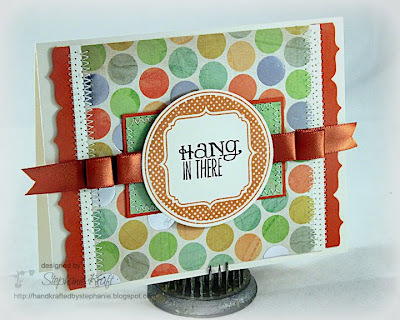 I'm new to blog hopping and have not heard of nor tried Verve stamps, but will certainly investigate. They look great. Awesome ribbon treatment and fun paper!